Jan Grape here: Bill agreed to help me out today as I couldn't manage with this bad sinus headache. I don't care what he says, he's a best seller in my book and been a good friend for almost 100 years. Thanks, Dr. Crider. Bill Crider here. Jan Grape’s a bit under the weather, and she asked me to fill in for her today. I didn’t have time to dash off any deep thoughts, but I did have something for her. It’s a piece I published on my own blog 10 years ago, and I was considering reprinting it soon. So instead of reprinting it on my blog, I’m using it here. Now and then someone asks me (though maybe not in these exact words), "How is it that somebody who's been consistently publishing for over 30 years, who's done three or four series, and who's sustained one of them for 30 years now, remains a complete unknown?" As Mike Hammer says, "It was easy." I just never had a hit. People who ask me to blurb their first novels sell more copies of it than I've sold total. People who started writing well after I did are now on the New York Times list. Maybe I just don't write the right kind of books, or maybe my books just aren't that good. (I'd like to disregard that second possibility, but there it is.) Reviewers like me (mostly), editors like me, readers (when they can find the books) like me. But here I am, unknown. I've come close to being known, though, a couple of times. When my evil twin, Jack MacLane, was writing for Zebra Books, the editor there really loved his work. After the first two books, I didn't have to offer a synopsis or even a title. My contract just said, "two books by Bill Crider." 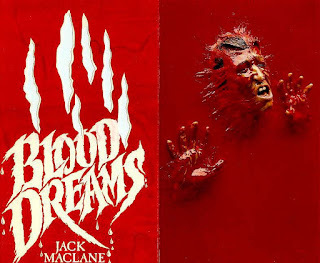 At one point, I was about to get The Big Push, with Blood Dreams. Die-cut cover with embossed inner cover. A dump in the front of all the chain stores. Publicity! The works. Didn't happen. The editor got pregnant and left the company. Another editor came in. 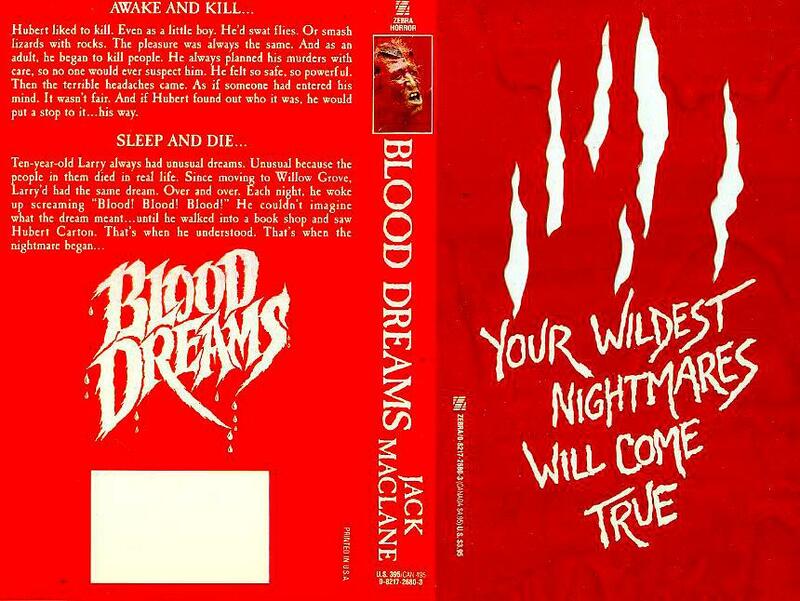 The book was slapped back to the regular list, with a regular cover. The dump in the chains? Publicity? Forget it. What proof do I have of this? Not much, except for a cover flat that I got when the big plans were being made. That's it in the pictures, both the outer cover and the inner cover. Pretty cool, right? I sure thought so at the time. I thought Jack MacLane was on his way. And he was, straight to oblivion, which is where he remains. My brief brush with fame was pretty short, but it was fun while it lasted. Bill, I’m glad to see you! You’re such a presence in so many places, it’s hard to fathom why your books didn’t go viral, as they say. You are one of our very favorite people. Susan Slater tells a story about Tony Hillerman, which I hope I can relate accurately. Discouraged at his dismal lack of success, he called his agent and told him he was ready to quit. His agent told him to wait, that he’d call right back. And when the agent did, Tony is quoted as saying he suddenly became a “one-point-five millionaire.” Sometimes it’s that close. Jan, I hope you feel better! Nice piece. Writers sometimes forget that like actors, painters, and musicians, lots of good writers do good work but never reach fame and fortune. the arts, I'm afraid, have to be their own excuse! Bill, you obviously have a following and some success, even if not a household name, or you wouldn't have lasted 30 years. The Ramones, who practically invented punk rock, never had a hit until they put out a greatest hits album. You're just a cult star! Bill, it's good to have you here. Whatever the reason for your not yet being "a household name," it's not because your books aren't great. And Paul's right--you certainly have a following. On a personal note, I'll always be grateful for your friendship, your advice, and your support over the years. Good column - there are so many working writers, artists, musicians, actors, etc., who plug away their whole lives, doing great stuff, and never hitting it "big". But to have made a living, or even a semi-living, at it is a major accomplishment, and to be published as much as you have - Wow. That I’m renowned. Why should I be? And I accept it. Wouldn’t you? Not simply “noted”; merely “famous”. Such accolades belong to Amos. With manner worthy of his name. In someone as renowned as he! Will have another face to show. (As only truly great men can). You know the rules. GET ON YOUR KNEES! Bill, in any case, I very much enjoyed your 2015 novel, BETWEEN THE LIVING AND THE DEAD. A tale well told with engaging characters. I guess we write what we like and hope that the reading public likes it too. I've enjoyed your web site about pop culture as well as well as your writings. You're #1 with us even if the NYT is behind in the times. Thanks for the comments, folks. That was written ten years ago, but it's still pretty true. 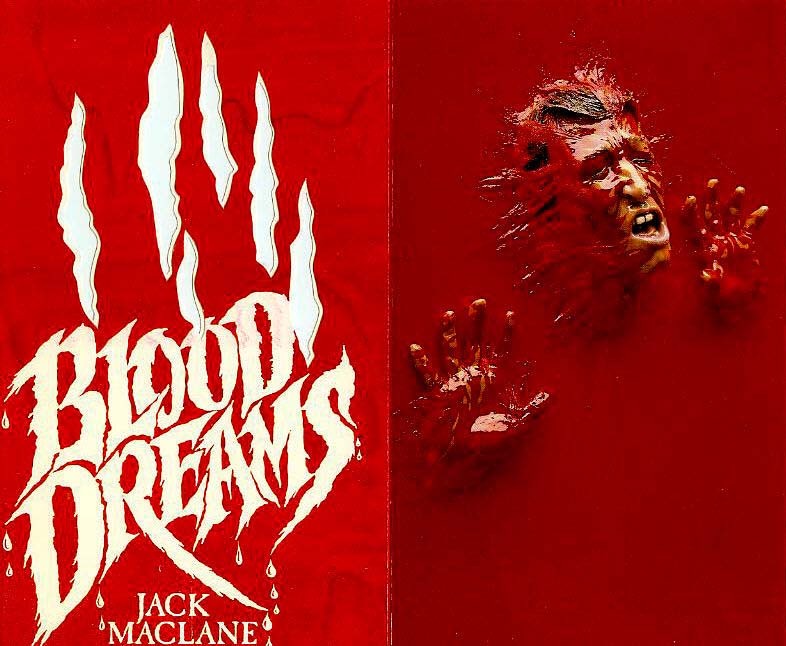 My one regret is that the great cover for Blood Dreams wasn't used. I really loved that cover. An excellent article Bill and I thank you for covering for me. I've said for years that publishers are short sighted. If they put just a little of the money they spend on someone who is already a bestseller into one or even two of their steady mid-list authors they would have two more best sellers. They'd make more money and the authors would make a better living. And their top authors wouldn't be hurt. I have no idea why folks don't know about you already, Bill. However, I had no idea until now that you had ever written under another name. Any other names you care to share so I can see what my library has? I tried the above and there was no luck. Whether or not they had them before the great paperback purge of a few years ago when they were cutting inventory and selling tons of books in a desperate attempt to balance the budget, I have no idea. Aside from house names, Jack MacLane is the only pen name I've used. Old Jack has been chained up in the basement for years now and hasn't done any writing. Oh, wait, that's a lie. There is one other pen name, but I'm sworn never to reveal it. >Oh, wait, that's a lie. There is one other pen name, but I'm sworn never to reveal it. Great piece, Bill. And I assure you the novel that you kindly blurbed for me has not sold as well as yours. I wish that were my pen name, though I am thinking about writing my next one as Steffie Meyers. My blurb on Greenfellas might've been detrimental. Great book, though. Bill, I love hearing behind-the-scenes stories about writers who persevere and who publish many books, even without enormous fame and fortune. I had no idea that my Facebook friend nearly got the big push. Congrats! Now I have two new authors to seek out. Good wishes to Jan as well.